Help gwendolyn to repair Albian Castle for the Convention of Magic Masters! 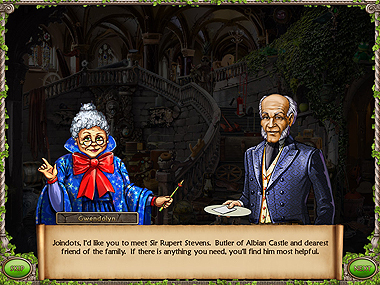 You gracefully accept Gwendolyn’s invitation to the castle and so begins your magical adventure in Chronicles of Albian. Gwendolyn sends you off to work immediately to sift through the cluttered rooms of the castle, looking for valuable items that can be sold to Fitz the leprechaun-like shopkeeper. Any profits you make must be used to repair and renovate the castle with new bridges, towers and stone walls. 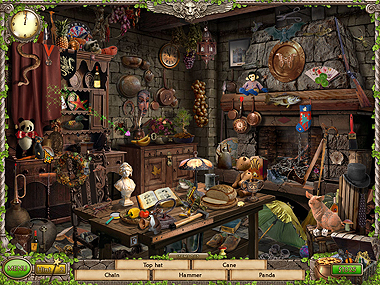 Chronicles of Albian is a charmingly straightforward Hidden Object game. Some say it is a little too uncomplicated for their taste, but in our opinion it’s exactly what you need after a long hard day to wind down. With beautiful, fairy tale graphics and lots of objects to find, it’s a perfect choice. To be completely honest, this game has some really challenging searches. The castle rooms are really cluttered, objects can be super tiny and half hidden behind other objects. Even Hidden Object game experts will find themselves racing against the clock. You get 3 hints at the very beginning, but then you need to find magic wands in each level to get further hints. If you find one among the clutter you get a hint at the location of one object. There’s also a tiny hidden fairy. If you find her, she’ll pick out a random object for you. 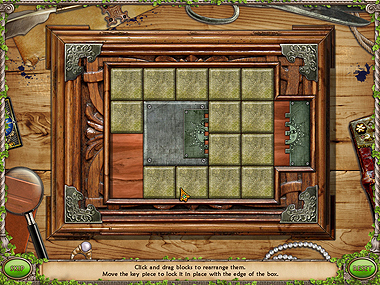 Every once in a while you’ll receive a special mission from one of the convention’s guests to complete a puzzle or a rare hidden object scene. These missions are relatively easy (Jigsaws, Spot the Difference, Sodoku) and you get paid for them so it’s a simple way to fill your pockets with more gold. So relax, allow yourself to get lost in the magical fairy tale land of Albian. Visit the castle’s art room, wine cellar and armoury, discover unique items and maybe even a lovely fairy or two. To have a truly lighthearted experience, you can play the game in Relaxed Mode so you don’t need to feel pressured by a time limit. 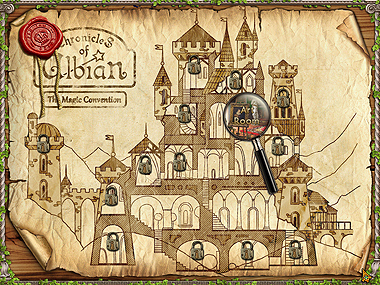 All in all, Chronicles of Albian is a delightful, magical Hidden Object game that’s fun for you and the whole family! NEVER GET TIRED OF PLAYING YOUR GAMES. VERY INTERRSTING GAMES DONT GET TIRED OF IT. I JUST DONT KNOW WHAT TO SAY. I RATHER PLAY HIDDEN OBJECT THEN DO HOUSE WORK. When i first play this game i thought i was not going to be a fun game but when i was playing i new this game was soooo much fun. I love this game to were i would play it over and over again. Merci, de m’envoyer des jeux gratuits. THIS IS THE MOST ANNOYING WEBSITE I HAVE EVERY HAD THE DISPLEASURE TO COME AC CROSS. JUST TELL ME HOW TO DELETE FROM MY COMPUTER. YOU SHOULD BE SUED FOR THE AMOUNT OF TIME I HAVE WASTED TRYING TO GET THIS OFF MY COMPUTER. great games thank you so much. Hey Rinry,Great video. I totally agree, alouthgh FYI…sequels do technically include parts beyond part 2. I believe sequel comes from the work sequence, or series, and therefore SMB3 is technically a sequel of SMB. Not a big deal, just a clarification. A video of Top 5 Part 2′s is just as awesome. Love this game, after rennovating the castle and surrounding grounds with upgrades it is my new wallpaper!! I love this game. I wish there was other hidden object games like this one.!!! I really like games like-coconut queen-gemini lost— which I hope a sequel is coming out for both of these. Games like villagers are fun.Will there be an updated virtual families? Thanks for all the stress relief fun w/these games. Love the games and could play all the time. I love the game, could play all the time. This is the most challenging game I have played in a while. I really liked this game alot. Almost lost it at the very end and then recovered it and finished it. I really wish there were other hidden object games like this one. Ones where you have to work to build your characters and towns etc. Please try to make more Freegames and I will play to the end. Thanks!! Really fun game, sad when it ended. May play again soon. I like to play a lot of games. Hey folks just finished playing a beta of this game too. If you liked this one just wait until you will see the next one. I just hope it comes out soon! Loved playing the game, but when a commercial was supposed to come on, it would lock up my computer, but no commercial would play.